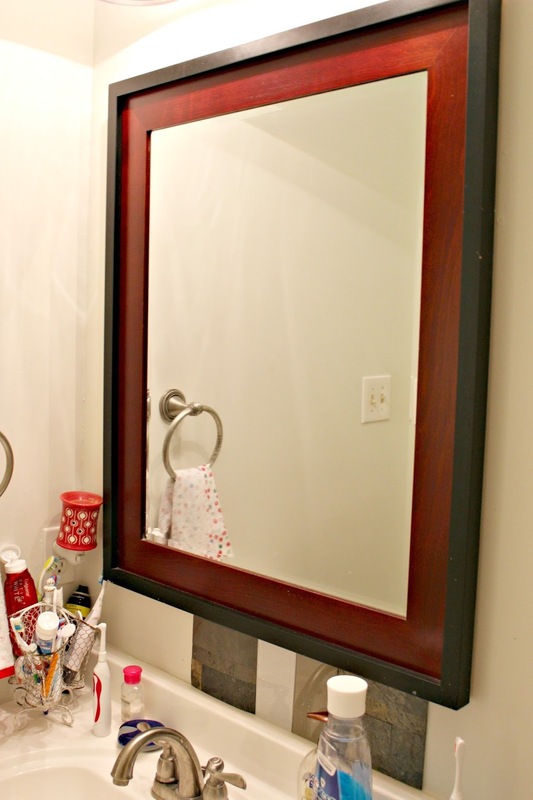 Follow the highs and lows of my attempts to transform my powder room from a traditional style to a modern bathroom design on a $100 budget! Hi, friends! Welcome back to the second week of the $100 Room Challenge! If you’re just popping in for the first time, and aren’t sure what the $100 Room Challenge may be, let me give you a quick recap. Some of my favorite bloggers and I will all be making over a room with a $100 budget in just four short weeks! Many thanks to Erin of Lemons, Lavender, and Laundry for putting together such a fun event! 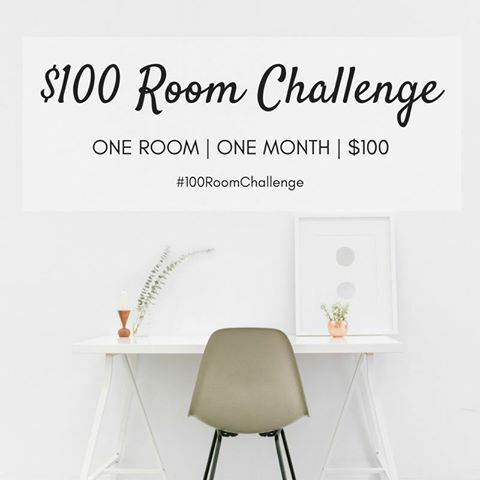 For more information on the $100 Room Challenge, check out my post from last week! I am in the process of making over my much-neglected powder room. 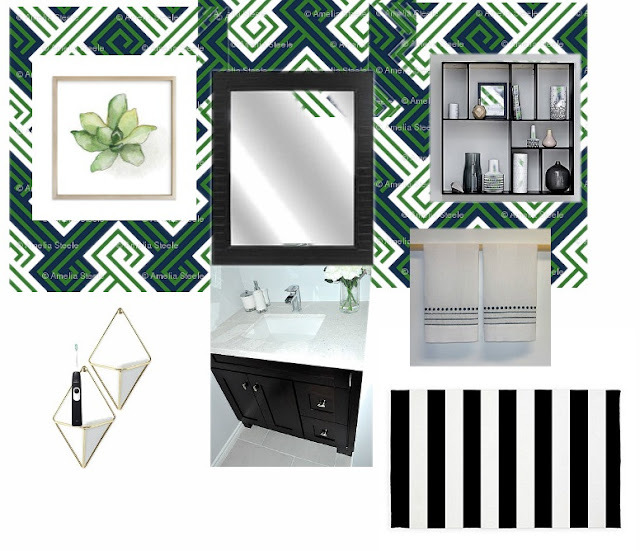 Last week I shared my inspiration board which included a lot of bold navy and green pattern with strong accents, and I was feeling pretty good about my choices. This week.. not so much! 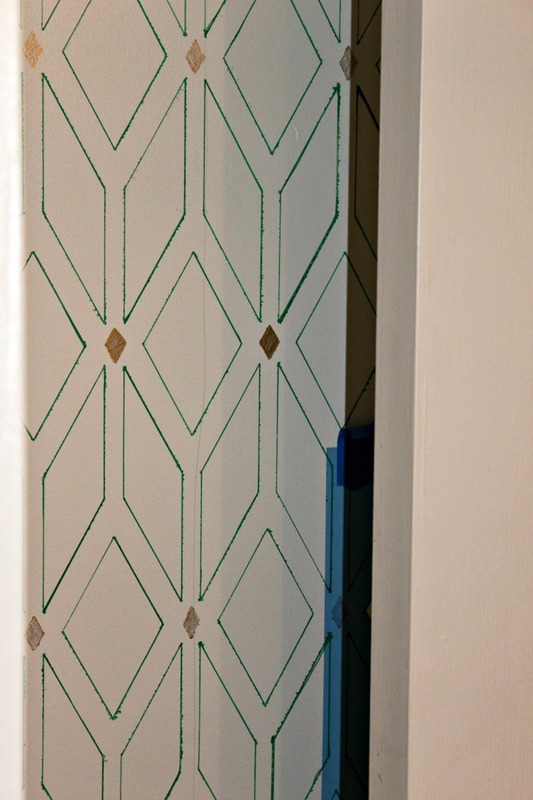 So, I loved the greek key pattern on my inspiration board, but I was having a difficult time finding a stencil in my budget range. I did, however, find this fun stencil that I thought would work just as well. I should have gone with my heart. 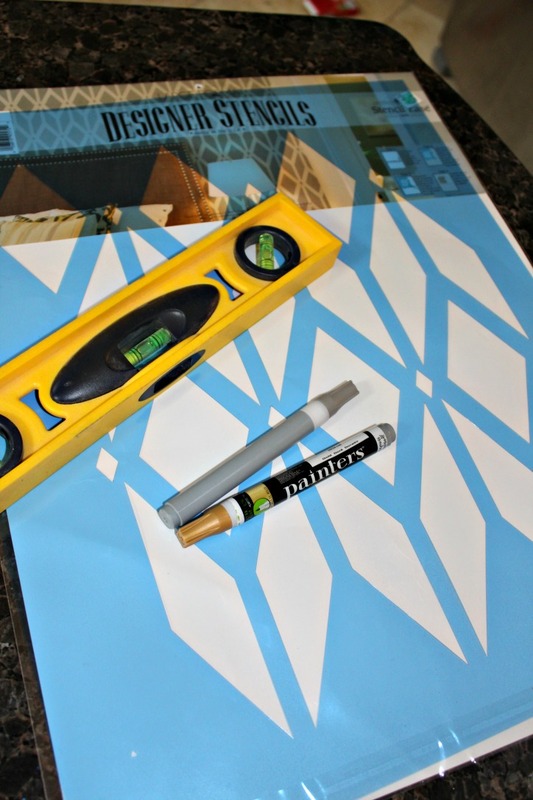 I purchased the stencil for $12, and already had the paint pens I thought I would use, but when I started to stencil it out I wasn’t overly impressed, and neither was my husband. I wanted bold, but the paint pen just made things look unfinished. Soo.. I’m going back to my original plan to go bold with paint. And although it isn’t currently looking like I’d like it to, I have faith it will! Although it won’t be as flexible and it might not have the staying power that something less bold would have, I will LOVE it instead of always looking at it like “meh..” I’m not really where I’d like to be, but I think I’m on the right track. I promise to have a LOT more progress to show you next week! Make sure you check out these other room makeovers! I bet many of these ladies are in much better shape than I am! I fight with myself on subtle versus what my heart says too. Can't wait to see more next week! I'll be painting as well this weekend! I don't think you'll be sorry you went bold. It'll look great! I am impressed that you are stencilling an entire wall! Glad you decided to go with your heart and go bold in the end! Go bold or go home, they say. Keep up the great work and follow your heart. 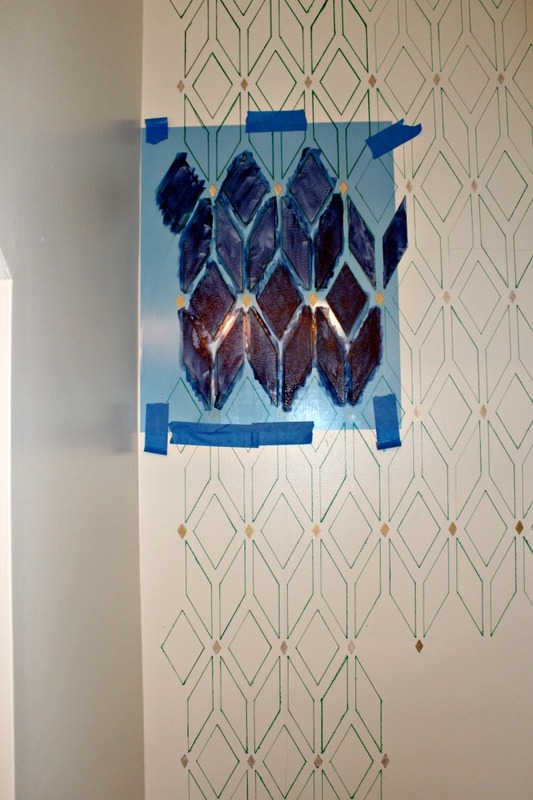 I think your stenciled wall will have gorgeous impact! I can't tell you how many times what I thought in my head didn't work out like I planned… I like the pattern you chose, and the colors in your inspiration board are awesome – one of my favorite color palettes of the challenge, in fact. You've got this! I adore the colors you chose and am right there with you on the bold vs subtle battle! I do it all the time and am always thrilled when I go bold! I cannot wait to see it all come together! You know, I've totally been there. You have this great idea but somehow it just doesn't work out that great. How nice to share with your readers the stumbling blocks of makeovers. I'm sure you'll find that right technique and can't wait to see it. Yay, I always vote for going with your gut! Excited to see the finished product. Love is always bettet than "meh…". so go with it! I love that bold stencil design you decided on. Can't wait to see what you do with it! I think going bold with paint is a great choice, especially because that was your vision all along. Can't wait to see how it all turns out. I can't wait to see the bold colors you go with. Nothing wrong with changing directions mid stream. Happens all the time to me!